Wisconsin is blessed with over 13,000 miles of beautiful trout streams that have prolific mayfly, stonefly and caddis hatches which create great opportunities for fly fishing for brook, rainbow and brown trout throughout the trout season. The state also offers a variety of stream types to fly fish, from the spring creeks of the driftless area in Southwest Wisconsin to the freestone rivers of central and northern Wisconsin and the Great Lake tributaries for steelhead and salmon fishing. 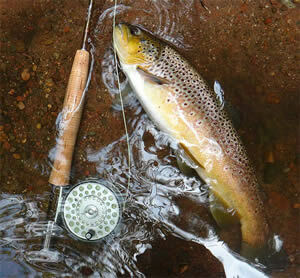 Most of the content found on the WiFlyFisher website is dedicated to fly fishing for trout in Northern Wisconsin. Although, much of the information will also apply to any of the trout streams in Wisconsin, including the driftless area trout streams. The website also includes a listing of the local fly shops and fly fishing guides found throughout Wisconsin with links to their websites for more detailed information about local trout streams, hatches and fly fishing equipment and fly tying materials. For the Wisconsin trout fishing regulations see: Wisconsin Inland Trout fishing regulations 2019-2020. The freestone trout streams of northern Wisconsin offers many fly fishing opportunities to catch wild brown, brook and rainbow trout while immersed in beautiful forest scenery. There is something truly special about wading in the iron-colored northern Wisconsin trout streams surrounded by tall majestic pines, deep blue skies and watching deer, eagles and other forest creatures in their natural setting. Northern Wisconsin freestone trout streams, such as the Bois Brule River, White and Namekagon Rivers have an abundance of mayfly, stonefly, caddisflies and other aquatic insects that hatch throughout the Wisconsin trout fishing season. If you are not familiar with the various mayfly species that hatch on Wisconsin trout streams see the Wisconsin Mayfly Hatch Chart & Caddisfly Hatches and Lifecycle of Caddisflies. For more detailed information, including preferred nymph habitat, general time of day emergence and spinner falls see: Overview of the Wisconsin Mayfly Characteristics. Copyright © 2019 WiFlyFisher.com. All Rights Reserved.